Institute of Jazz Studies archivist Angela Lawrence shows students a portion of IJS's substantial archive. Students in NJPAC’s All-Female Jazz Residency get some “Women to Women” advice from the pros. Young women embarking on careers in jazz have a tough walk to the front line. How do they build credibility to stay in sync with their male counterparts? How can they tell if pick-up, late-night jams are intended to be productive – or pick-ups? Is there an unspoken etiquette to approaching the masters for advice? That last question also became a wish fulfilled for the two dozen students of NJPAC’s All-Female Jazz Residency, a week-long, arts education intensive that speaks to the sparsity of women on the bandstand. Six of the faculty members, all tops in their field, gathered on July 13 for “Women to Women: Navigating a Life in Jazz,” a panel and Q&A for the 14- to 25-year-old participants. The third annual residency, held for the first time at Rutgers University-Newark’s newly restored building at 15 Washington St. and in partnership with the storied Institute of Jazz Studies at Rutgers-Newark, enrolled instrumentalists and vocalists from New Jersey and places beyond, like Wisconsin, Idaho and Canada. The program is directed by GRAMMY-nominated pianist and composer Geri Allen, winner of this year’s Jazz Journalists Association Jazz Hero Award. The panelists free-wheeled on a range of topics, many of which concerned an excessive emphasis on a female artist’s comportment, rather than her chops. They offered tips on how to deflect well-meaning criticisms from fans and told relevant anecdotes of their personal encounters with jazz greats. Also lending their expertise and insights to the afternoon panel were singer Connaitre Miller, pianist and composer Ellen Rowe, and radio personality Sheila Anderson of WBGO Jazz 88.3FM. The talk was held in Clement’s Place, a new club and performance space at the “Fifteen Wash” address in Newark’s downtown. Formerly located at Montclair State University, the All-Female Jazz Residency allows students to board, study and rehearse in proximity to NJPAC’s campus and other sites of interest, such as WBGO studios and Duke’s Southern Table, a restaurant where they can perform. A tour of the Institute of Jazz Studies, for example, offered a glimpse into the prodigious archive of materials belonging to the singer and pianist Mary Lou Williams, the subject of a session earlier in the week. 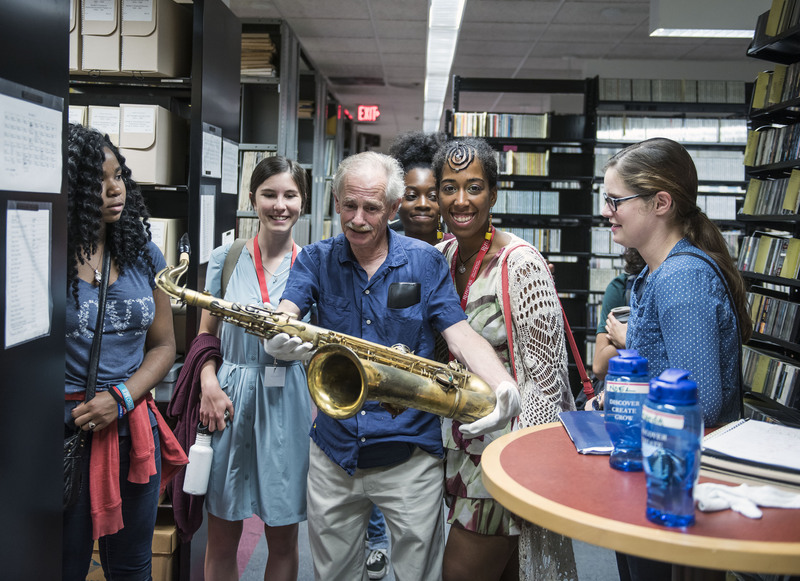 And a few students couldn’t resist the opportunity to take a selfie with Lester Young’s saxophone, held gingerly by a white-gloved jazz scholar. Allen’s faculty of accomplished musicians, who mentor and help equip the young women with the skills they need for improvisation and performance, also includes an A-plus male contingent: saxophonist Bruce Williams, vibraphonist Stefon Harris and drummer Jeff “Tain” Watts. Fuller said she encourages aspiring jazz professionals to “seek the lesson in every opportunity.” Jensen’s advice to beginners is to keep both groveling and rudeness in check around fellow players. 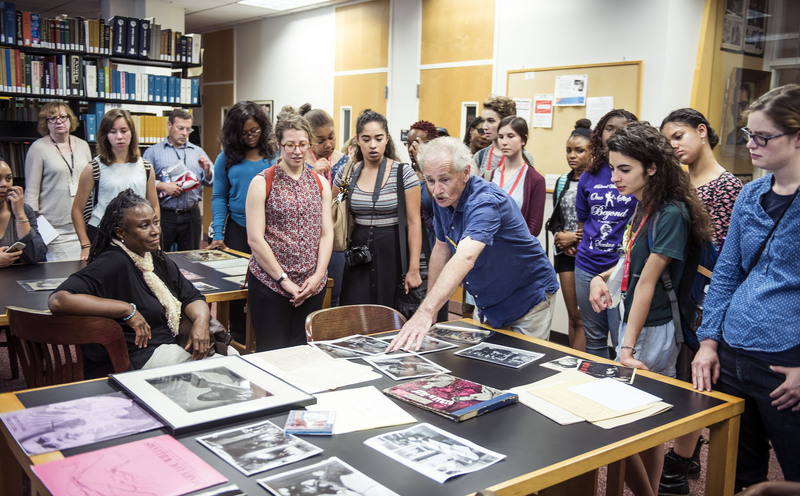 Top: Institute of Jazz Studies archivist Angela Lawrence shows students a portion of IJS's substantial archive. Left: Tad Hershorn of the Institute of Jazz Studies shows students materials from Mary Lou Williams's archive. Right: Hershorn displays Lester Young's saxophone.